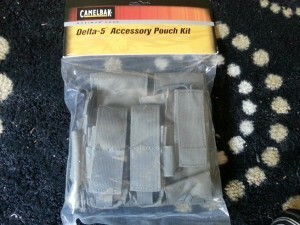 The folks over at Botach Tactical had this CamelBak Delta 5 MOLLE Attachable Pouch Kit on sale for $15.00. I am putting together a couple of MOLLE tactical vests and ordered up this kit to try out. What follows are my initial impressions. After some field use I will report back more. 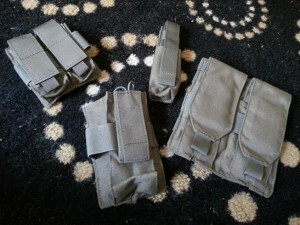 This set includes several items including a double magazine pouch, a M4 magazine pouch (two magazines), light pouch, and a radio pouch. First impressions open inspection of the pouches was they looked and felt like a high quality item. Not heavy by any means – these do not feel like cheap airsoft knock-off’s. No – they have a feeling of durability. One of the first things I did was check the stitching. 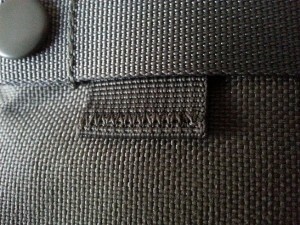 For the load being carried – stitching looks plenty good for the application. There were no loose ends which could unravel. 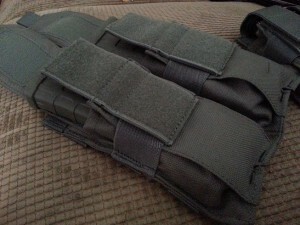 Pistol magazine pouch – Holds my S&W M&P9 magazines as well as my XD9 mags just fine. 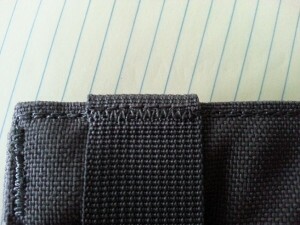 Velcro closure is aggressive enough to keep everything where it needs to be. Sub-compact mags would be a problem as the pockets are too deep. This could be accommodated quickly by wadding up a Zip-loc bag and shoving it in the bottom of each pocket. Radio pouch – I found the radio pouch to be a bit oversized for my radio’s. My Midland FRS/GMRS radios are pretty much swallowed up. Quick access to the radio would not be easy. My Wouxan handheld HAM radio fit’s nicely – although the retainment strap was a bit loose. I added a knot which shortened the strap and now it is perfect. M4 magazine pouch – Pretty much your standard dual mag pouch. Velco enclosure like the rest, though the velco can be stuffed out of the way so the magazines be accessed quicker. My Magpul PMAGs fit just fine. 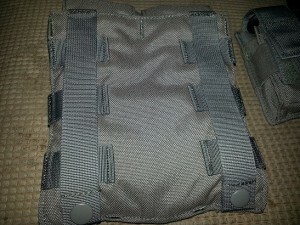 MOLLE straps snap securely. 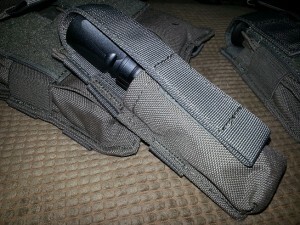 Light pouch – Holds a multitude of flashlights or an extra pistol magazine. You can carry more, and carry it easier with new CamelBak Pouches. Manufactured with 1000D Cordura® and tactical-grade nylon and elastic, CamelBak Pouches attach easily and securely to any MOLLE system. Overall Impression: Excellent. At a regular price of $50.00 – a decent value. At the special sale price of $15.00 – what a bargain. More to come with further testing. 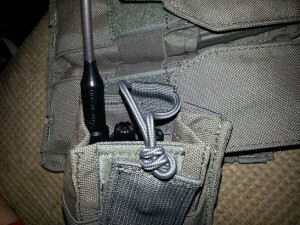 The radio pouch is for an MBTR. They are a bit bigger than the standard Motorola type.